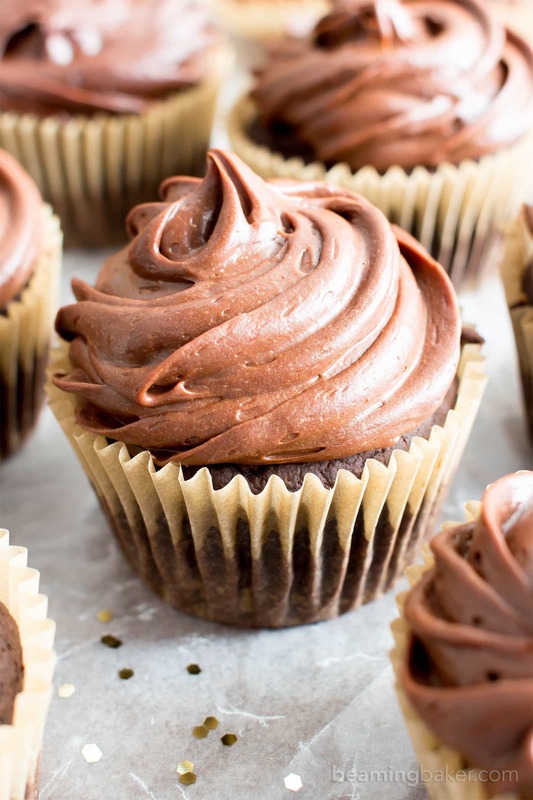 Vegan Gluten Free Chocolate Cupcakes (V, GF): an easy recipe for deliciously moist chocolate cupcakes topped with silky smooth chocolate frosting. Vegan, Gluten-Free, Dairy-Free. ”Make one, eat one. Make one, eat one. It’s the ideal work situation!” That’s exactly what Erik said to me while “helping” me frost these cupcakes. Ahh… Erik. Without him, I’d have so much more leftover dessert in the house. So… it’s my birthday!!! 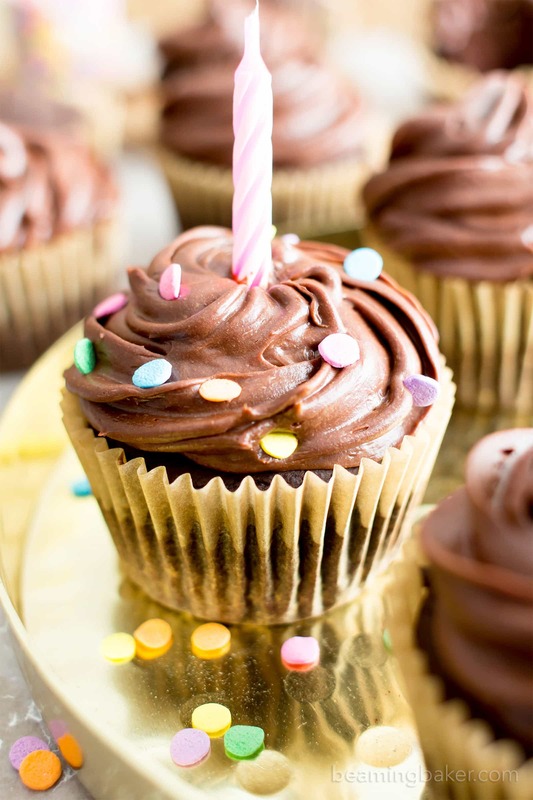 Okay, technically, it was my birthday a few days ago (but I wanted to share the incredible frosting recipe to this recipe first before these cupcakes… plus Mondays REQUIRE cupcakes, duh). I also apparently wanted to say recipe like 500 times in 1 sentence. What can I say, the birthday girl gets what she wants! Am I still technically a “girl” since I’m safely nestled in my 30s? Eh, whatever! Who’s excited to celebrate with me? Just me? Dang it. No matter, I’m quite used to typing/talking to myself as I’ve been doing this whole blogging thing for a little while. Anywho, it’s been my goal ALL year (plus last year) to share the ultimate vegan gluten free chocolate cupcakes with you on my birthday. But alas, I was never quite satisfied with how to even approach a birthday cake recipe. And I was also too busy sassin’ Erik to apparently work in this recipe. 😉 Update: I’ve finally shared my Gluten Free Vegan Chocolate Cake Recipe! It’s moist, easy to make, and has already received rave reviews from around the world!! Even though those don’t sound like actual, fully-formed reasons, I assure you, they were. 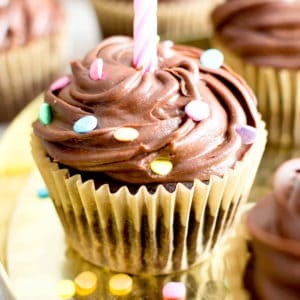 Erm… basically, how could I make the perfect vegan chocolate cupcakes—nay, the perfect Vegan Gluten Free Chocolate Cupcakes, without refined sugar, without that fluffy refined flour… and without messing up the whole perfect-texture birthday cake thing? Well, I started with the frosting. Why wouldn’t we start with frosting, right? You can read all about the stunningly thrilling and shocking cliffhanger-ending process in my How to Make Homemade Chocolate Frosting post. But this cake. THESE CUPCAKES. They are so perfectly fluffy and just the right amount of dense to hit that satisfying sweet spot. You know what I mean right? I’ve had cakes that are way too light… that I end up eating way too much of and feeling like I didn’t eat much of anything at all. But then I’ve had cakes that’ve been way too dense and just feel… undeliciously heavy. That’s right. Undelicously. You know what I mean. Like a heavy poundcake! The cake is just sweet enough, and deliciously chocolatey… but not too sweet that the frosting needs to be scooped off (yeah, I know some of you folks do that out there. No judgements!) 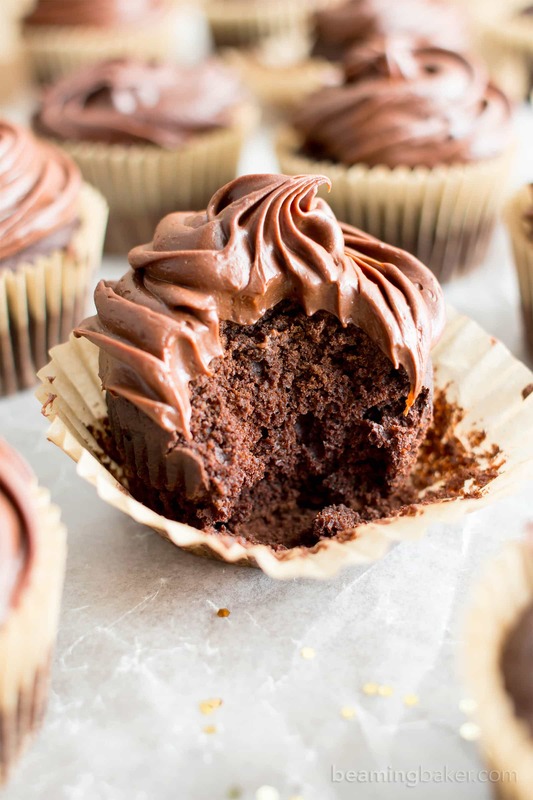 2nd totally relevant update… hehe: I’ve recently shared an amazingly easy recipe for chocolate ganache cupcakes that you’ll absolutely love! 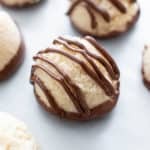 (They’re topped using the dreamy ganache from my How to Make Chocolate Ganache Recipe post.) ???? The frosting + the cake: oh, SO good. in fact… they can be stored at room temperature for up to 3 days! 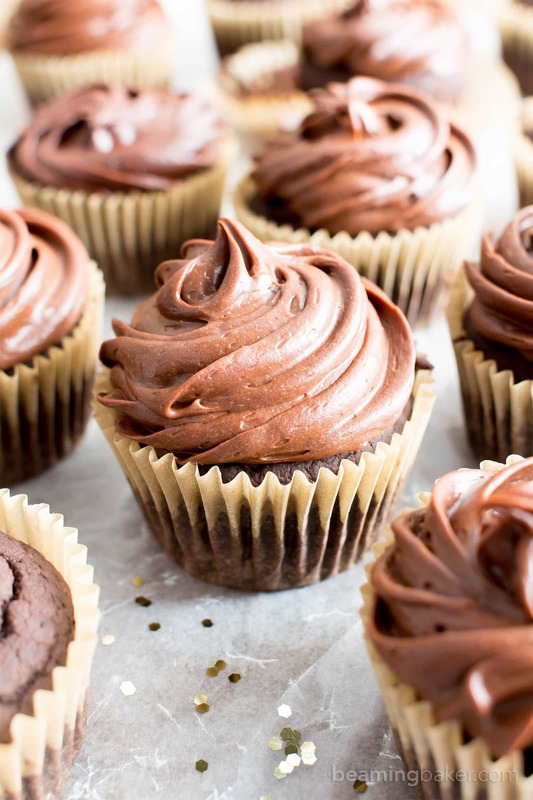 Vegan Gluten Free Chocolate Cupcakes (V, GF): an easy recipe for deliciously moist chocolate cupcakes topped with silky smooth chocolate frosting. Vegan, Gluten-Free, Dairy-Free, Refined Sugar-Free. In a large bowl, sift together the dry ingredients: oat flour, cocoa powder, baking soda and salt. Add water and milk to a microwave-safe bowl. Heat in 10-second increments until just warm. This will prevent the melted coconut oil from solidifying once mixed with these liquids. In a medium bowl, whisk together all wet ingredients: water, milk, coconut oil, sugar, maple syrup and vanilla. Whisk until well incorporated. Add wet ingredients to dry ingredients. Whisk until just incorporated, making sure no flour patches remain. Pour batter evenly into prepared muffin pan—filling each cup about ¾ of the way. Bake for 16-20 minutes. Mine took 18 minutes. Test for doneness with a toothpick. The toothpick should come out with a few dry bits of cake on it, but no liquidy batter. Place muffin pan on a cooling rack to cool for 30 minutes. Remove cupcakes from muffin pan and continue cooling on rack until completely cool before frosting. Frost using this Chocolate Frosting recipe, or your preferred frosting. Enjoy! Storing instructions below. Try this decadent 'n moist Vegan Chocolate Cake Recipe! - Storage notes: Store in an airtight container in the refrigerator for up to 1 week. Okay to keep at room temperature for up to 3 days, in a cool, dark environment. - Freezing Instructions: Store frosted cupcakes in an airtight, freezer-friendly container for up to 1 month. Allow to thaw at room temperature for 15-40 minutes before enjoying. 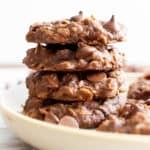 - More Chocolate Baked Goods (all V, GF): Fudgy Paleo Maple Pecan Brownies, Chocolate Banana Nut Bread, Peanut Butter Chocolate Chip Cookies. Here are a few items I used in today’s recipe. ???? I’m so excited to try this recipe! 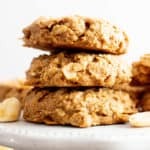 I LOVE that you use oat flour because vegan and paleo ingredients can be kind of expensive, and I’ve been trying to find some cheaper options. So thank you! Aw, thanks Chris! 🙂 Chocolate is definitely everything!! Thanks for stopping by! I am loving that these are vegan and gluten free. Delish! I love chocolate cupcakes! 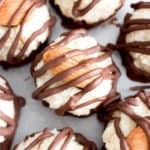 These look so decadent and chocolatey – simply delicious! Can’t wait to try this recipe! They’re the best!! 🙂 Thanks Natalie! Yay – chocolate cupcakes for everyone. That icing looks perfect and I could eat them all. Oh yes!! The icing is SO good!! Thanks Danielle! 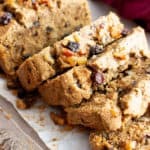 This sounds like a great cake recipe, love that it has got no eggs… It means it is scalable to smaller quantities which is perfect for me! Hi! Do you have any nutritional facts for these? I have to say, these cupcakes are pretty darn good! They came out a bit dense for me, but I really enjoy the flavor! It’s a relief to find a good dessert recipe for birthdays since my little brother can’t have dairy and gluten! Awesome! So glad you liked it, Anna. 🙂 Yep, I do love me some dense cake. 😉 Happy that you little bro gets to eat this! ???? Thank you for this recipe! This is the best gf, dairy free vegan cupcake I’ve tried to make! I ground my own oat flour, so the texture was a little too course in the cupcake, but I think if I buy a finer flour they will be perfect next time. Loved them! Hi Stacy! It’s my pleasure. 🙂 I’m so glad you enjoyed it. 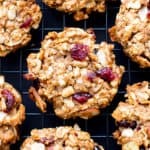 Oh yes—the oat flour needs to be fine. Hope you get to try again! ???? I found your blog using the Google search engine. I’m used to enjoying cupcakes that contain typical ingredients, such as eggs, milk and butter. I’m willing to get out of my comfort zone by trying a vegan cupcake. Unfortunately, it’s a challenge to find gluten free flour in my area. Is it possible that I can substitute all purpose flour? Hi LaTrice! So happy to have you here. ☺️ That might work—I haven’t tried it myself. Let me know how it turns out! These were delicious! So rich! I used almond flour and they were perfect. Question…I would like to make a cake instead of cupcakes? Have you tried that? Any changes I should make? Thanks for sharing this delicious recipe! Hi Demeter! 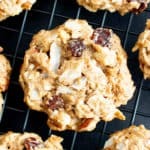 Where do you get your oat flour? I’ve seen Bob’s Red Mill oat flour, but it is not GF. Thanks, and I can’t wait to try these! This recipe became a staple in my kitchen, thanks so much! Woohoo! So happy to hear it Pam! ???? Hi I am making these this weekend! 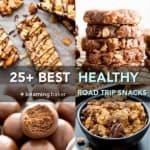 My son is allergic to dairy and it is difficult to find cocoa powder that is dairy free or trace free – I was wondering if I could sub the cocoa powder with cacoa powder? Has anyone done this? These cupcakes are incredible! I followed the recipe exactly as written and they came out fluffy, chocolate-y, and moist. 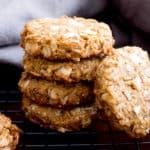 No one would ever know that these are vegan, gluten-free, and refined sugar free! Woohoo!!! I’m so pleased to hear that, Josie. 🙂 It’s amazing when people can’t tell at all—my goal with every recipe on the blog. Enjoy! These cupcakes are wonderful. Thank you so much for the recipe. This recipe will be a new favorite! I am making this for my Fiance birthday tomorrow and so excited!!! You have mentioned coconut sugar in the wet ingredients and you mixed it with the wet ingredients, I am not sure if this is typo mistake or I supposed to do the same! Hi Monica! Yes, the coconut sugar goes into the wet ingredients. 😉 Once it dissolves, it becomes a liquid. Hope you two enjoy!! Wow! 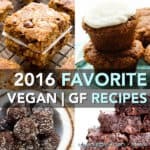 I have made a lot of GF CF cake recipes over the last 8 years and I am in love with this one! Made the cupcakes and frosting yesterday. 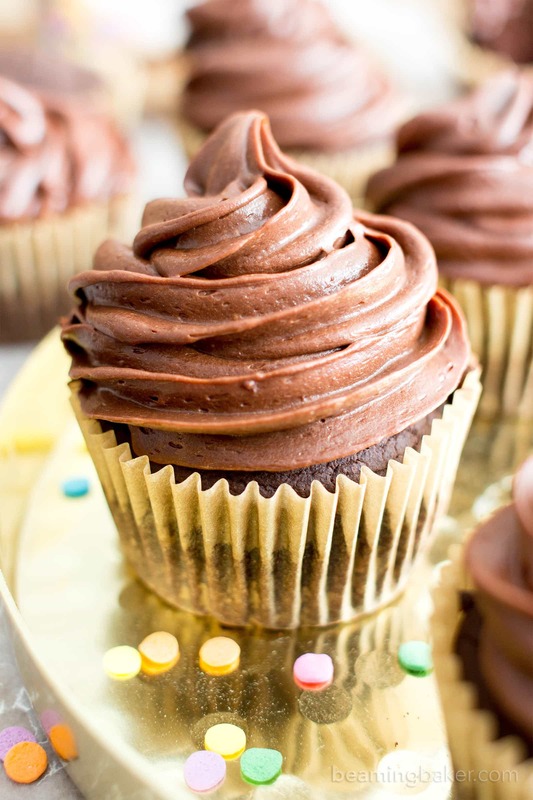 Cupcakes are so moist and were so easy to make! And I love the 2 ingredients frosting! How easy is that! Thank you for sharing! Woohoo! So happy to hear how much you enjoyed them Crystal! I know, I can’t even tell you how much time I’ve saved with had frosting recipe. ???? Thank you for taking the time to share all these kind words with me! I made this (and the frosting) recipe last night for a dinner party I had for a group of ‘meatatarians’ and they loved them. They were pretty much gobsmacked! Yay! No one can resist the power of this chocolate cake! ??? ?